One of the Avatar series' strong points is character development and depth. All the main characters are portrayed as "marvelously flawed human beings," and the series shone in its initial season with the characterizations of its main antagonists. Aang (Mitchel Musso in the unaired pilot, Zach Tyler Eisen onwards) is the fun-loving, 12-year-old protagonist of the series. He is the current incarnation of the Avatar, the spirit of the planet manifested in human form. 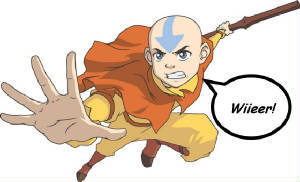 As the Avatar, Aang must master all four elements to bring peace to the world and restore the balance between the Four Nations. Aang loves to travel the world and is always eager to learn new things. At times he is somewhat naïve of the world and others' true feelings, as he is often too preoccupied with the events immediately surrounding him to notice what occurs on a more in-depth level. Katara (Mae Whitman) is the 14-year-old sole remaining Waterbender of the Southern Water Tribe. Katara, along with her brother, Sokka, discovers Aang at the beginning of the series. She and Sokka accompany him on his quest to defeat the Fire Lord and bring peace to the war-torn nations. Katara is mature, loving, and responsible. Always looking out for the well-being of others, she is an apt leader when the situation calls for one. However, she can be overbearing at times, and believes without exception that her way is the right way, never relenting on her views even when they are disproved. Despite Katara's kind nature, she has a temper which, when combined with her impressive Waterbending skills and idealistic views, can be quite destructive. After the passing of their mother at the hands of the Fire Nation, Katara took on a motherly role over her older brother, Sokka, a nature that she later took to in relation to Aang. She is also the only person who can calm Aang down when he's in the avatar state. Sokka (Jack DeSena) is a 15-year-old warrior of the Southern Water Tribe who, with his sister Katara, accompanies Aang on his quest to defeat the Fire Lord. Sokka describes himself as "meat-loving" and "sarcastic." Unlike his companions, Sokka cannot Bend an element. However, the series frequently grants him opportunities to demonstrate his true gift: ingenuity. He takes great pride in his mental and physical strength, though it is often overshadowed by others' ability to Bend. He is extremely clever, relying on science where the mystical and martial arts elude him, though his silly and immature manner often causes others to underestimate his intellect. Toph Bei Fong (Jessie Flower) is a 12-year-old, blind Earthbender who leaves her wealthy lifestyle and home to join Aang on his quest in order to teach him earthbending. Toph has largely lived alone all her life due to over protective parents, which makes her somewhat selfish, sarcastic, and, at times, bitter and arrogant. (She is the strong and silent type.) She also does not hesitate to speak her mind and be bluntly truthful. Though blind, Toph has been shown to be a very exceptional Earthbender. She "sees" with Earthbending, feeling vibrations in the ground that objects make when moving. Zuko (Dante Basco) is the exiled 16-year-old prince of the Fire Nation. Zuko is obsessed with capturing the Avatar in his quest to restore his honor and redeem himself in the eyes of his father, Fire Lord Ozai. His character matures throughout the show, influenced by his time as an exile, and he becomes less of a spoiled prince and more of an emotional outcast, at times struggling with his feelings of pity and bonding with the same people his nation has terrorized. He often acts coldly, but has revealed himself to be a very caring character as well - a trait which most often is exhibited in the presence of his Uncle Iroh. Zuko's appearance is well-known due to the scar over his left eye, which he received during an Agni Kai with his own father. His regret, hate, and shame includes the loss of his mother. Azula (Grey DeLisle) is the 14-year-old princess of the Fire Nation, Zuko's sister, and Fire Lord Ozai's favorite child. Azula has been cruel and self-centered her entire life. Her mind is set on war and power; she manipulates and even tortures others to advance her own desires, ignoring family and emotional bonds whenever necessary. As a Firebending prodigy with a sadistic personality, Azula is a dangerous bender. She is one of only two benders shown who can bend and produce lightning. She sees others as expendable, and intimidates her lackeys and all those under her command. Iroh (Mako in seasons 1 and 2, Greg Baldwin onwards) is a retired Fire Nation general and Prince Zuko's uncle. Iroh is the older brother of Fire Lord Ozai and was the original heir to the throne of the Fire Nation. A powerful Firebender of great renown and respect, he looks upon Zuko as a son more than as a nephew, especially after the loss of his own son, Lu Ten. On the surface, Iroh is a cheerful and kind old man whose hobbies include drinking tea, playing Pai Sho, and singing. While studying the Water Tribes, Iroh found a method of re-routing electrical currents, either natural or artificial, and aside from Azula he is the only Firebender that is shown to be able to create lightning. Much older and more experienced than any of the other main characters, Iroh chooses to take a less active role in the affairs of the series, acting as more of a mentor and guide to Zuko and most everyone he meets, including Aang and company. Appa (Dee Bradley Baker) is Aang's Flying Bison who serves as the group's main form of transportation around the world. He was stuck in suspended animation with Aang for 100 years and shares a very strong bond with him. He possesses the ability to fly and can use his tail to create powerful gusts of air, as well as draw objects to him by inhaling deeply. Momo (Dee Bradley Baker) is an intelligent and curious Winged Lemur who travels around the world with the group as their pet. Momo also loves to eat and will eat as much as possible when a lot of food is available. Jet (Crawford Wilson) is a charismatic teen who holds a deep grudge against the Fire Nation. He was the leader of the Freedom Fighters, a group of teenagers who spent their days antagonizing Fire Nation soldiers. Later, he decided to start a new life in Ba Sing Se. Jet was killed by Long Feng in his base under Lake Laogai. Jet uses Twin Tiger-Head hook swords as his weapons. Long Feng (Clancy Brown) is the intelligent and cunning Grand Secretariat of Ba Sing Se, head of the Dai Li, and advisor to the Earth King. In reality, the Earth King is merely a figurehead of Ba Sing Se's government, as it was actually Long Feng who held the real power, until Azula overthrew him. Mai (Cricket Leigh) is an impassive, bored, nearly emotionless 15 year old who, along with Ty Lee, accompanies Princess Azula on her quest to capture Zuko, Iroh, and the Avatar. Mai specializes in throwing weapons, which she conceals in many parts of her clothing. She has a crush on Zuko, which is her only known emotional concern. Fire Lord Ozai (Mark Hamill) is the ruthless ruler of the Fire Nation, father of Zuko and Azula, and younger brother of Iroh. He is leading his country in a century-long war against the other three nations to create an empire and awaits the arrival of Sozin's Comet so that the Fire Nation can utilize its Firebending-enhancing powers to win the war. Avatar Roku (James Garrett) was the Avatar before Aang, who was born to the Fire Nation. Throughout the series, Avatar Roku appears as a spiritual advisor to help Aang fulfill his duties as the Avatar. Suki (Jennie Kwan) is a fifteen year-old girl, the leader of the young female warriors of Kyoshi Island. She is a tough, skilled fighter, and staunch ally of Aang, Katara, and Sokka. Suki has a close relationship with Sokka. Ty Lee (Olivia Hack) is a fourteen year-old, cheerful and energetic young woman who, along with Mai, accompanies Princess Azula on her quest to capture Zuko, Iroh, and Aang. Ty Lee is a skilled acrobat who strikes pressure points to disable her opponents. She also exhibits a crush on Sokka. Admiral Zhao (Jason Isaacs) is a hot-tempered Fire Nation admiral in pursuit of the Avatar and Zuko's principal rival throughout Book One. He was killed by the Ocean Spirit after he tried to kill the Moon Spirit and cripple the Northern Water Tribe.